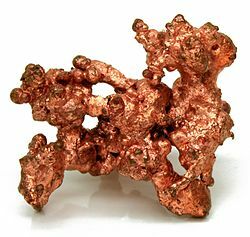 Copper is a reddish naturally occurring metal. In water it is typically dissolved as a divalent cation (Cu +2). There is lots of copper in the environment since it is widely used to make copper pipe and tubing, and copper compounds are used as pesticides and herbicides. The most common way for copper to get into drinking water is through corrosion from copper plumbing fixtures. Native copper. As you would expect, it’s copper colored. It’s good to make wire with, but bad for your liver and kidneys if you ingest too much. This may cause high levels of copper in drinking water. The presence of copper corrosion is often indicated by blue-green staining of fixtures. Copper is a necessary nutrient, but too much copper can cause nausea and vomiting, and long-term exposure can lead to liver damage and kidney problems. Copper can be controlled in whole house (POE) applications and plumbing fixtures protected by cation exchange (a water softener), pH control, and film-creating compounds such as polyphosphates. Water with low pH soaks up copper, and usually raising the the pH of the water cures the problem. For point of use treatment, reverse osmosis removes copper handily—usually around 97%. Copper can also be removed by distillation and activated carbon adsorption.